According to a new report from MarketingSherpa, the B2B marketplace is rapidly evolving, and marketers are resistant to adapt to the latest best practices. 68% of B2B marketers haven’t even identified their Marketing-Sales funnel. Resistance to market changes and the failure to identify the customer journey are huge obstacles for improving B2B marketing effectiveness. In light of these challenges, it’s refreshing to know that progressive and successful B2B marketers are offering advice to become more innovative and customer centric. “Speak customer”, “Be Human” and work to innovate by understanding the sales funnel so performance can be optimized are the trends to follow. 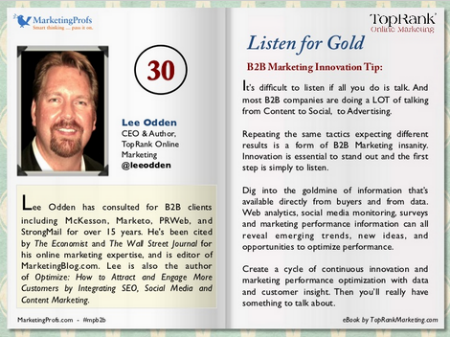 To advance B2B marketing innovation, TopRank Online Marketing and MarketingProfs have partnered to create an impressive collection of 33 B2B Marketing innovation tips from some of the top B2B thought leaders and brands. You can view the full eBook embedded from Slideshare below. You can also get more info on the B2B Marketing Innovation eBook on this post at Online Marketing Blog. From Ann Handley herself to famous B2B marketers and social media strategists like Paul Gillin, Joe Pulizzi, Amber Naslund, this free eBook is a cornucopia of great advice on how to break free of boring B2B. Top B2B marketing brands and practitioners include IBM, Cisco, SAS, Salesforce, Silverpop, Lattice Engines and many others. Download the eBook from Slideshare and let me know which is your favorite tip.